You think of it and there’s a software for your requirement already in the market. So, if you are looking to create some professional quality software to create sleek and polished slideshows, yes, you have them as well. A slideshow (otherwise known as presentation), software allows the users to showcase their collection of pictures within one slideshow. This helps them avoid opening each image individually. 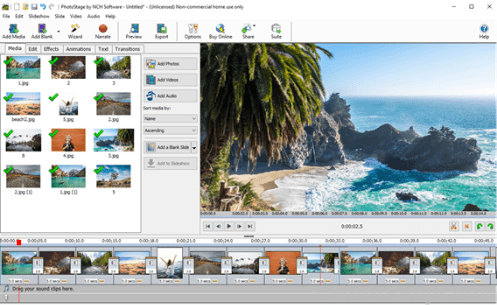 These programs allow you to create image presentations by letting you add some impressive added effects with music, subtitles, captions, or animations offering that added image details. We all have a collection of photos on our desktops, laptops, or smartphones, but clicking through each off them can be time consuming and monotonous. Here you need the assistance of a slideshow software that will not just help transform your favourite clicks into super looking slideshow, but will also be fun to experiment with. So, for your convenience we have created a list of some of the best software for creating slideshows in the business. Let’s take a quick look. 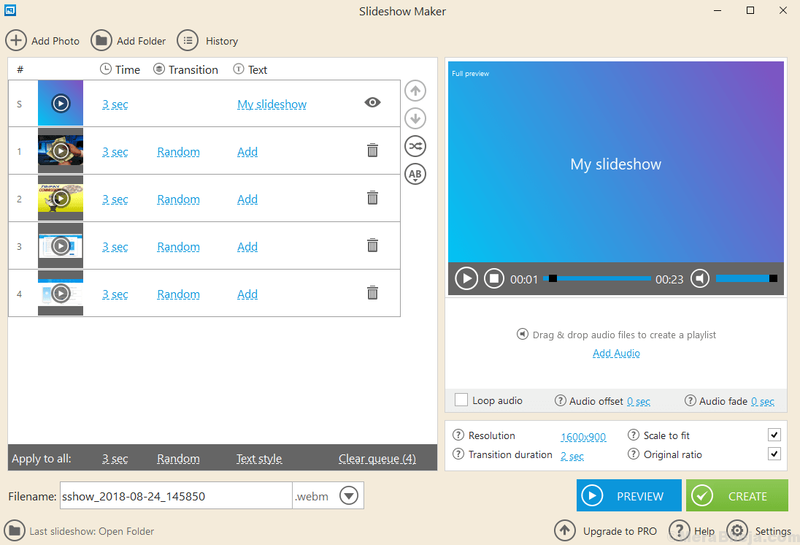 Movavi Slideshow Maker is a live example of a powerful program that’s easy to use. It’s known for being a well-rounded software that allows the user to make slideshow videos in a jiffy. You can add unlimited photos and videos, either as a complete folder or separately. Not just that, you can also add several audio files at a time or simply choose from the pre-loaded sound effects and use. Once done with all of that, you can now add the transition effects to be implemented on the images and the videos, indicate the variables like the format and directory for the output, and you are all set. Additionally, you can also carry out the fundamental edits like auto-enhance, rotate, volume balancing, and more, individually, to the included media before making the slideshows. The preview pane located on the right end allows you to preview any changes easily and accordingly modify them using the playback buttons. From BMP, GIF, PNG for Images, or 3GP, MP4, MKV for Videos to AAC, FLAC, MP3 for Audio, the program supports a wide range of input and output formats. System Requirements: Windows 10, 8, 7 and XP. One of the most popular slideshow making software in the list, Icrecream Slideshow is a robust tool that enables you to make image presentations in slideshow format using photos and music. It comes with a sensitive interface with simple and easy to use controls. What we especially like about the program is its appealing design with cutting-edge options that help you to make superior quality slideshows with least effort. The application allows photos in a wide range of formats such as JPEG, TIFF, PNG, and JPG. It also lets you add music in MP3, WMA, and WAV formats. From adding sound track or organizing the balance, to controlling each image in the presentation by selecting a desired time of showcasing, the software has a lot to offer. Resize the photo to fit the screen, keep the original size, or control the time and type of the transition effects, this program helps you with all that and more. Photostage Slideshow Software is certainly one of the easiest to handle. You can create professional level slideshows which you can personalize with its wide range of tools and options. You can add photos, music, transitions, and a lot of more powerful tools and actions. What we especially like about this application is its collection of a wide variety of photo editing features. It surpasses all its competitors by supporting all formats of photos, videos, and audios. Moreover, it allows you to share the slideshows easily by directly uploading it to YouTube or by burning a DVD. If you are looking for an application that can help you create HD presentations, then Magix PhotoStory Deluxe is the right choice for you. Available in only version (paid), this program is compatible with only 64-bit Windows version. It perhaps has the most wide range of editing tools compared to its competition. It comes with 250 slideshow transitions which includes 3D and HD transition effects. Additionally, you can choose from its 132 themes and backgrounds that again includes added enhancing tools. Bonus – it also comes equipped with wonderful options to add animations and its own editing options for full image and music. This allows you to mix up to seven background scores into one presentation while it offers 750 sound files for the presentation. That’s not all! The program also offers amazing photo editing tools that allows the users to implement HDR effects, correct red-eye, color correction (secondary), or customize contract smoothly. Proshow Gold is a fast and simple platform for music and imagery integration that includes videos also. 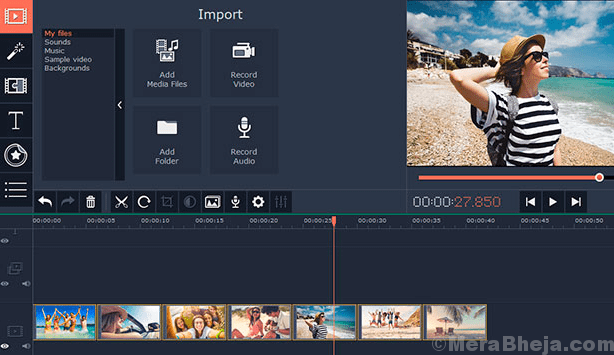 This super-efficient program allows you to import media from many different platforms like Facebook, Picasa, Instagram, and more saving those precious clips on your phone from being lost. The platform is easy to operate and so, it makes it easier to use video just like you would work with photos. For improved experience, the program also offers integrated themes and free tracks. Whether you are beginner or a pro, Proshow offers some amazing automated features for all in addition to the state-of-the-art technology for pro users. iSkysoft Slideshow Maker is one slideshow making program that’s suited for both the first timers and the pros with its two self-explanatory usage modes – Standard and Advanced. While the Standard mode allows you to create slideshow videos effortlessly with the help of the preset templates and the styles, the Advanced mode offers much more delicate controls that enables you to add clip arts, motion effects, transitions, and more. The USP of this program is its user interface which is a breeze to use. All you need to do is to add the images and the videos to start with, that would be used in the presentation, and then move over to the next step. You can then add pre-audio, transitions, credits to the intro, and a lot more to the slideshow content while you can also edit the elements on pre-elements fundamentals. In the last step, you can save the slideshow video in any supported formats, copy it to optical discs directly, or simply share it on YouTube. From MP4 or AVI to MOV or MKV, the program supports almost all file formats. It comes with a free trial period that allows you to access the Pro account for 14 days for free. Creating slideshow with Animoto is just about a few clicks. It’s a web-based program and so, all you need is a web browser to start using it. You can use from its huge collection of preset styles that are further categorized into events like Party, Wedding, and so on. Now that you have chose the style, all you need to do is to add the photos or videos to the slideshow, or straightaway bring them in from social media platforms like Facebook and Instagram. You can now select a background score to be added along with any text-based captions. Bonus – you also get to preview a real-time sample, albeit in low resolution, while you are inserting the images and the videos. The last step would be to press the button that says “Produce”, and your creation will be in process. The final video can be then shared on social platforms like Facebook, Twitter, etc. Picovico is a web-based straightforward application that helps you create slideshow videos with no added effort. It is amazingly easy to use and you can start by just creating a free account. As you log in, simply press the “create video” trigger on the top right corner of the web page, and the website guides you through a sequence of steps to help you create videos. While creating the videos, you can upload the images and even add text-based slides to set-up the slideshow. In addition to that, you can specifically mention the available genre presets of the background score, or add your own. In the final step, mention the variables like the quality of the video, privacy, and more, and rest is taken care of by Picovico by creating a nice-looking slideshow in minutes. You can preview the output video in any browser, download it in MP4 format, or instantly share it using the social media buttons. Slidely is much more than just a slideshow maker, because it also allows you to create photo collages and image collections of good quality. It’s in fact sort of a social network platform, where you are not just allows to share your slideshow videos, but you can also follow other creators who inspire you and even view their collections. Slidely allows you to cover everything staring from photos from your PC, or import some photos from popular social media platforms directly for instance, from Facebook, Twitter, or Dropbox. Moreover, once you are finished adding images, you can also create background score that can be either uploaded from a PC, or brought in from YouTube or SoundCloud. The final step is insert added information such as title, details, etc. and then hit the “Save my Slidely” button. The output video presentation is then ready to be shared with Slidely Profile or directly to Facebook or Twitter. This program helps you to create image slideshows and then convert them to DVD and Blu-ray or transfer them over to different video formats. What we especially like about this software is that its graphical user interface is an open source software and that can be added Windows directly from the web-page. The GUI offers 245 transitions and more 100 effects to enhance the slideshows. Not just that, you can also add live backgrounds and image animations to the slideshows making it all the more attractive. Moreover, adding multiple background scores and subtitle texts with added effect is a feather on the cap. 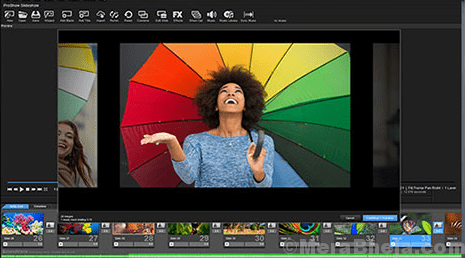 With tons of software available in the market these days, choosing the right slideshow maker software can be overwhelming, but our list makes it easy for you to find the one that suits you the best. So, create amazing slideshows and create an impression.